If I could give any advice to someone moving home, it would be to plant a small plum tree as soon as they have settled in. Apart from the remarkable abilities of courgettes they are the most successful crop in the garden, putting up with any number of adverse weather conditions and requesting no effort in return. I looked out into our front garden this week and saw our valiant little tree laden with dusky-pink Victoria plums. That tree has seen out two longed for greengage trees that shrivelled and died without producing a single fruit. 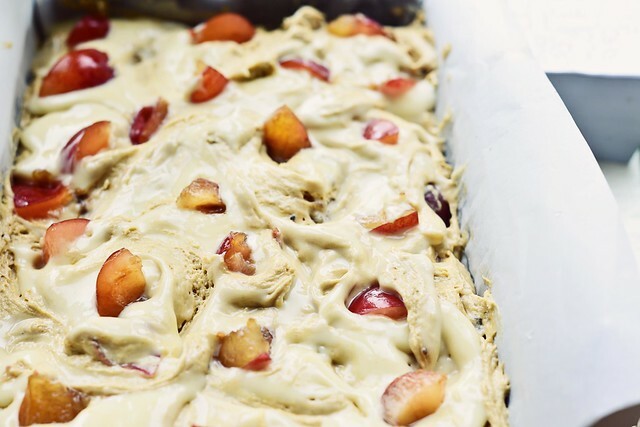 I made one bowlful of ripe plums into a tray bake cake that has allusions of being a cheesecake. I almost didn’t share this recipe for a reason that would seem ridiculous to most. The last two posts we have published have been rectangular things. The Apple Focaccia and Ed’s Gift Box are both somewhat oblong and beige. To post another brown, rectangular ‘make’ upset my chi, or chakra or ‘visual OCD’ if you will. I was on the brink of making it again in dinky little round tins just to shake things up a bit. But then I decided to get over myself. If you like a cake that can give you the ‘clartyness’ of cheesecake, the toffee rich flavour of muscovado and the tang of fresh fruit then this is one for you. So here it is, in all its simple quadrilateral glory. Leave to cool in the tin before cutting into squares. It’s really good with some Jersey cream and a drizzle of syrup…so I’ve heard. My cake is based on a Waitrose recipe that sounded delicious, but people had found unsuccessful due to issues with the runny cheesecake mixture. I have amended some ingredients and most of the quantities to get this just right. 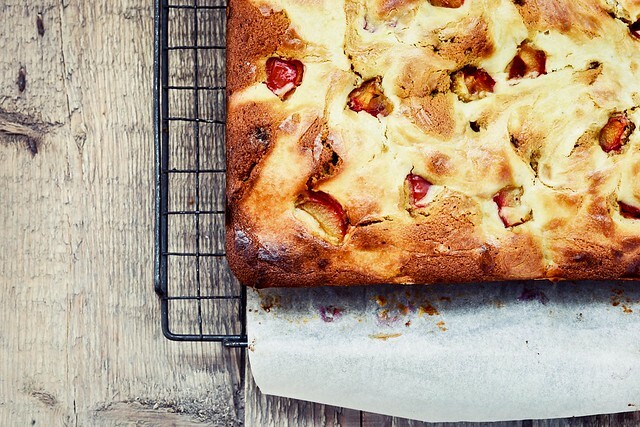 I adore plums at this time of year and cannot wait to start baking with them. 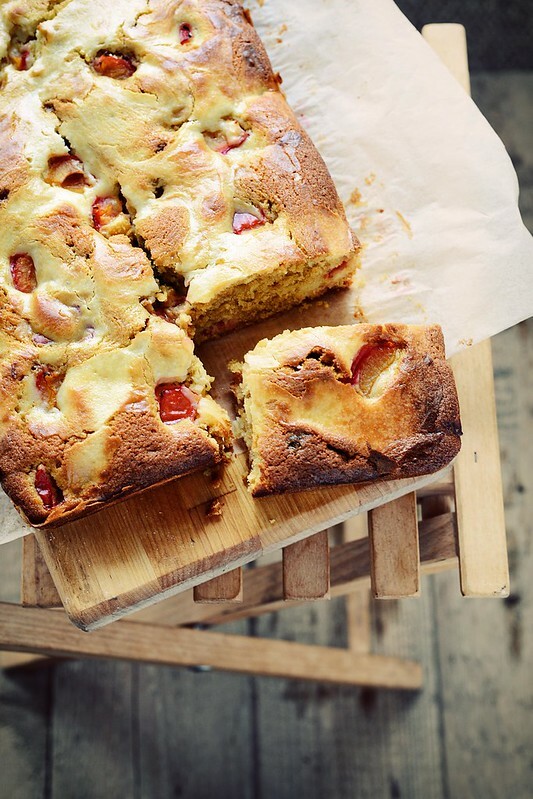 This looks like the perfect autumn bake. This looks absolutely delicious. I love a good quadrilateral! When we finally move we’ll have to plant a plum tree. Far tastier than damned courgettes. I want a piece sooooo bad!!!! This looks amazing and will be on my list to attempt soon, and the photos are fantastic too. Good job. Reblogged this on Chocolat Chic 09. When I was in Gloucestershire, the growers were complaining that this year’s plum crop was the worst ever. There were hardly any to be had. Lucky you to have fresh plums from the tree. I don’t mind how many rectangular posts there are if they look this good. I have to say, I love that you almost didn’t post this because it was square. I’m exactly the same way, always thinking that too many “white” posts or “dark” posts in a row will throw off the balance. Glad you did “get over yourself” as this looks delicious! I hope our newly planted plum tree produces next year. I’m in love with your bakes, they looked fabulous! Awesome… Your posts look lovely anyway – whether rectangular or vertical it’s got the good chi flowing in either way! We live in an apartment and having a plum tree in your garden – it just took me back to my childhood when we used to live in colonial bungalows with huge gardens. Well we didn’t exactly have plums but had loads of mangoes and guavas which we would pluck for Mum to make fresh sweets from! 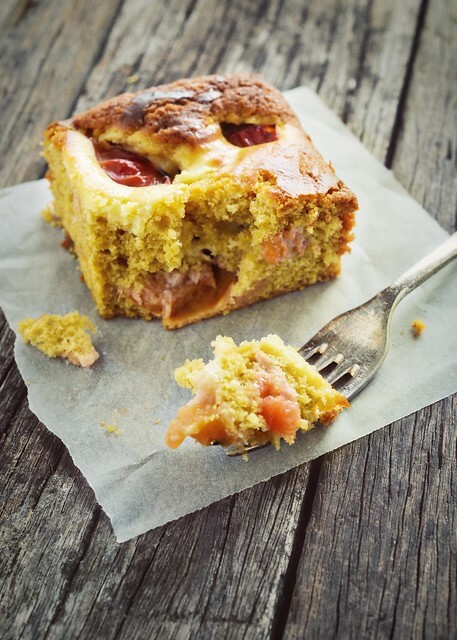 This cake sounds really good & I love the photos! I’ve included a link to the recipe in my “Friday Favourites”, here: http://www.thechocolatebox.se/2012/09/fredagsfavoriter-v-38_21.html I hope you don’t mind! The blog is in Swedish, but if you want a translation (somewhat crappy though), you can use the translate button on the bottom right. Made this yesterday and oh my word it was fab!!!! Went down a treat with the family and will deffinetly be making it again! I honestly didn’t think it would taste as good as it did. Thanks anyhow for sharing – I always seem to have success with fruit cakes! Hi ‘Three Little Birds’ So glad you liked it…and thanks for spotting my mistake. Looks like you got it exactly right though. I had made an error in the ingredients list so what you did was correct, 75g of each sugar. I have amended it now. I am sure any other mix of sugars would work well but I have the worlds biggest collection so I mix and match depending on the flavour/texture I am after. Thanks for your lovely comment. 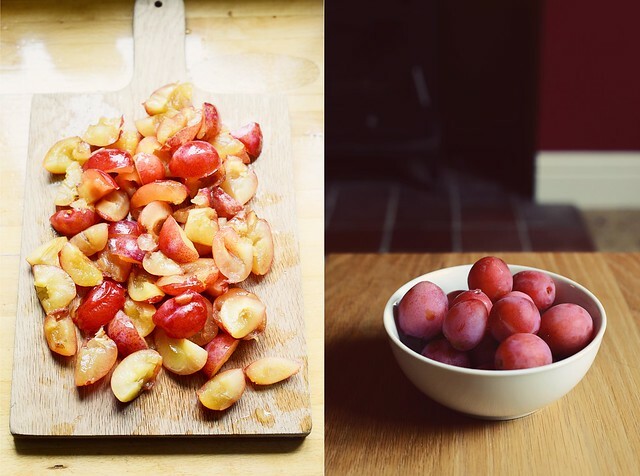 Somehow I’ve managed to miss this post last summer… Which fruit would you recommend to use instead of Plums? any soft fruit would work, I think.